Heat a large nonstick skillet over medium-high heat. Coat pan with cooking spray. Add carrots and onions; sauté 1 minute. Stir in coconut milk and next 5 ingredients (through pepper); cook 30 seconds, stirring constantly. Add the chicken; cook 1 minute, stirring to coat. Remove from heat; cool. Warm tortillas according to package directions. Spoon about 1/2 cup chicken mixture down center of each tortilla, and top each with 1/3 cup angel hair slaw and Greek Yogurt. Roll up. Cover and chill. Can be eaten chilled or warm. Tip- if you aren't eating these within a day or 2 refrain from pre-making the wraps, they can get soggy in the fridge. 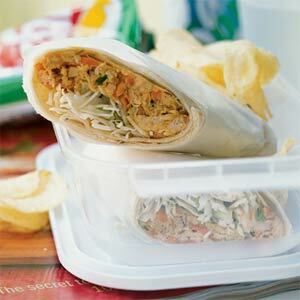 Instead put the filling in a container and make each wrap fresh when you are ready for it!